Immediately after Easter I will be leaving the Potteries after 23 years. We all moved here in the Summer of 1992 when I became the Church of England Vicar of St Werburgh’s, in Burslem. We arrived with our five children, aged from 3 to 14 years. At that time Stoke and Vale were both in the newly formed Division Two. It was the first year of the Premier League: yes it is that long ago! Since then I have become a Catholic, trained as a teacher, trained teachers, been ordained priest, served as parish priest of Bentilee, Hanley and Fenton, spent a little time as chaplain in hospitals, a prison and schools , given 10 years as Dean of North Staffordshire, and during all this time seen our family increase by 18 grandchildren and two great-grandchildren. So, as I now creep closer and closer to my sixtieth year, the Archbishop of Birmingham feels I am “ready for a new challenge” and has appointed me the parish priest of St Mary’s, Cannock. (Mercifully at least, still in Staffordshire). What will I miss most? someone asked me recently. I thought about this. The answer may be a little surprising. Of course, I will miss some special places. This wonderful location in Hanley - so close to the Coachmakers, Robertos’s, Jaflong and the Venus Fish Bar each of which I have frequented perhaps a little too often. I will miss the charming beauty of Our Lady's Church, at Fenton, and the magnificent glory of the Church of the Sacred Heart in Hanley, the most stunning in the City. I will miss the annual carol service at Hanley, our exuberant celebrations of Pentecost, the Fairs, and the Pea-and-Pie suppers. I will miss Our Lady's School in Fenton, which I have served for the past five years, and the group of nine schools in the Newman Collegiate in the north of the city: so many dedicated teachers and enthusiastic children, who have been a great joy to know. 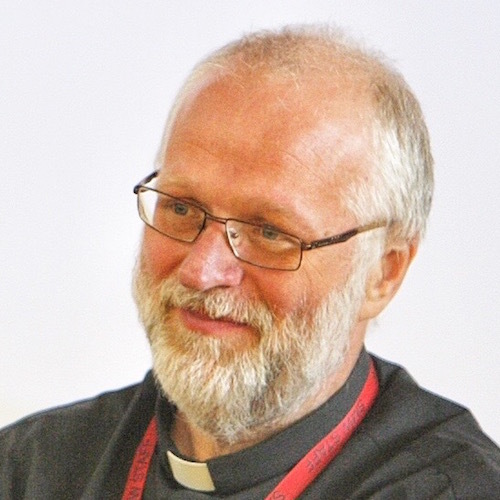 I will miss so many people in numerous other parishes too: the ones I got to know during my years as Dean and who still great me with warmth and affection. I will miss my occasional articles for The Sentinel, the interviews on BBC Radio Stoke (usually early in the morning!) and the staff in the local media who have always been so supportive and helpful. I will miss the volunteers who give extraordinary amounts of time as school governors, fund raising, managing Church resources, and leading parish activities. I will miss meeting again the children I have baptised, the couples I have married, the bereaved I have accompanied through sadness - and parishioners who I have laughed with, learnt from, preached to, infuriated and sometimes, perhaps, even inspired. I will miss colleagues: priests, our parish deacon, and the sisters of the Immaculate Heart; and also others: teachers and other school staff, doctors, nurses and care assistants, funeral directors and cemetery attendants and yet more, too many to count, who have become more than colleagues. Of course, all these I will miss, yet this might be said by any priest in any location moving on to a new post. But what I will miss most of all is the richness and diversity of this wonderful city, and Hanley, itself, which can never be matched wherever I may go. I will miss the ordinary folk of this city, and the tremendous diversity of those who have made their home here. I will miss those who bring the 25 or so different languages to our current community: the ordinary Potteries folk with their warmth and humour and deep roots in the city; the Filipinas for their wonderful culinary contributions to our celebrations; the Nigerians and other Africans for their piety and devotion; Zimbabweans, Ethiopeans and the Keralan Indians for their kindness and generosity; the Eastern Europeans - Czechs, Slovakians; and the priests of the Polish and Ukrainian communities who I have been privileged to work with so closely. To be sure, the diversity of our city certainly brings its challenges, but also, for a priest some small rewards: I have helped an Eritrean woman get a visa for the United States, appeared before a tribunal to plead for an Iranian man to be given the right to reside in this country, and supported many applications for Citizenship. I have helped get children of asylum seekers into schools. I have heard harrowing stories from people who have suffered persecution and violence and who have fled to this country for refuge. I will miss Hanley. I will miss Stoke-on-Trent. Love your City and North Staffordshire. It is a great place to be, to live, and to be valued. This was originally written for publication in the Sentinel newspaper on 20th January 2016. This is a slightly expanded version of the article. The Northern Powerhouse, the Pilgrimage of Grace, Our Day Out, and Downton Abbey. We have been hearing a lot about the “Northern Powerhouse” recently. Please forgive me if I am more than a little cynical about the whole thing. The North-South divide is acute and has long been so - and it is welcome that there should be a particular focus on the woes of the North of England (because of course, this debate is in no way about Scotland, nor indeed about Ireland or Wales). It echoes the late, great Margaret Thatcher (forgive now, the transparent irony) who spoke of a focus on the cities and, I vaguely recall, was delighted about winning “the Boltons” (as if they were “the Carolinas”). However, Mr Osborne, and the Tories in general (if they are to take up Osborne’s baton), will have a tall order. A report today indicates that the North-South divide runs far deeper than just a few years of economic decline. Children aged under five from poor families in the north of England perform less well than even the poorest children in London, according to a report from The Institute of Public Policy Research (IPPR). But it goes even deeper than this. The North-South divide is by no means only a recent phenomenon. Some of us are old enough (just) to recall when the North was, literally, the Powerhouse of the Nation - in the days of manufacturing, of coal, and steel - the days before (here she is again) Mrs Thatcher. But even in these “powerhouse” days, there was a North-South divide. Poor children in the North were being educated only as “factory fodder”, as the teacher Mrs Kay states in Willy Russell’s 1977 television play Our Day Out - and by the time the play was turned into a musical ten years later, the teacher adds “but now the factories are closed”. These days, the 1980s, saw the emergence of “Loadsamoney”, when the Chelsea supporters waved their bundles of notes to taunt the fans of Newcastle United. But this was just a manifestation of the same, very old divide. Its goes back at least 450 years. In the 16th Century the North of England rose against the South and was brutally tricked, defeated and smashed. The uprising against Henry VIII is known as the Pilgrimage of Grace, and was at the time in no way framed as a social uprising nor even a geographic one, but was a revolt against the religious changes enacted under Henry VIII. The outlines of what happened at that time are well known, but perhaps only in a superficial way. Henry VIII declared his independence from the Pope. He refused to accept the authority of Bishop of Rome over any matters in his realm. But that in itself is too simple a reading of what happened. Henry’s revolution had very little to do with religious belief (he always considered himself to be a Catholic), but was much more to do with greed and egotism. It was in fact radically secular. Henry’s reform did not mean the rejection of the power of Rome, but rather the assumption of the Church’s power into the Monarch. It was therefore the abolition of any countervailing power in the nation, and the removal of any court of appeal over the actions of the King. The relationship between society and Church was certainly ready for reform, but this was no reform, but rather a concentration of power that was formerly distributed. The Constitution was radically changed, and without even a referendum (such things were unknown, of course!) England moved suddenly out of Europe, and any checks on the authority of the state were eliminated. The Monasteries, certainly wealthy, but also centres of employment and learning, of health care and charity, were dissolved. Ancient treasures and manuscripts were destroyed, hospitals and almshouses closed, and centres of employment vanished. Henry took the land and property to himself and much was sold at low prices to a new class of wealthy individuals. It was massive privatisation which led to the destruction of an effective welfare and educational system, and an extra-ordinary increase in unemployment, in poverty and in vagrancy. In the wake of these changes, the North rose up, not perhaps yet aware of the social consequences of what was taking place, but certainly alarmed by Henry’s egotism and greed. The rebels were offered a compromise, and a willingness to listen to their concerns, then tricked and crushed in a brutally unrestrained manner, with no one to enjoin restraint or moderation. All sounds a bit familiar doesn’t it? And so the subjugation of the North of England to the south was established, and is rooted deep into the fabric of England. It took about 400 years for the state fully to embrace the responsibilities formerly undertaken by the Church and the monasteries of mediaeval England. Which is why, deep in the North of England, those posh people live in Downton Abbey. Tax Credits: Who is the more representative - the Lords or the Commons? I am not a statistician, but I am interested in the strength, persuasiveness and validity of arguments. In recent days it has been argued in connected with the debate on Tax Credits, that the view of the Lords lacks legitimacy - it is unrepresentative. But is this actually the case? No doubt the most important arguments in this debate are around fairness, justice for the lowest paid, and the injustice of increasing tax relief for the rich while removing it for the poor. But in the midst of this debate - which, given the resolve of the Tories is unlikely to have much impact on the final outcome - is a constitutional argument, about the role of the House of Lords in possibly holding up what is described as "the will of the Commons". The unelected Lords are not supposed to stop any financial measure from passing through parliament. This is a convention, not a matter of constitutional law - like so much in our British uncodified Constitution - and even though this measure was not included in the Conservative Manifesto earlier this year, and it seems was even explicitly excluded as an option during the election campaign, convention (it is argued) decrees that the Lords must not frustrate the measure, as it is a financial measure, and the unelected Lords cannot stand in the way of an elected Commons on the principle of no taxation without representation. The argument raises many questions, and no doubt many cynical observations, but just one struck me. Having been, for so many years, aware that the Lords had sat alongside the Commons with a large inbuilt Conservative majority - which had been reined in, from time to time, by these very conventions - I had not fully grasped that the Conservatives no longer have a majority in the Lords. The rather limited changes to the Lords which had taken place under Labour, and the consequence of the practice of appointing peers, had led to something of a lag in the manner in which the Lords reflects the membership of the Commons. In many respects of course the Lords is very unrepresentative. By age, definitely, by its very design. And also by gender. Certainly also by social class. And - given the refusal of the Scottish Nationalists to appoint to the Lords - it has also become unrepresentative of the political composition of the UK. It would also seem that the party make up of the Lords, too, is out of sync with the nation. After all, the LibDems have a huge number of peers (112) yet only 8 MPs, and UKIP, who gained a similar percentage of the votes in the General Election has just 2 peers. Of course, the Lords is not designed to be a proportionately representative chamber - but when there are such extreme variations, one might suppose that the argument that the Lords has no right to stand in the way of the Commons has particular validity. But is this so? I wondered. And I looked at the figures. The results are a little surprising. Making a little allowance for the incompatibilities of the various systems, it would appear that, on this particular issue at least, far from being less representative of the electorate, in fact the Lords is closer to the expressed will of the electorate. In the 2015 General election, with a clear programme for austerity (even if its details were kept unclear) the Conservatives gained the votes of just 24% of the electorate, which translated into 39% of the vote. Of the 61% who voted otherwise, the great majority supported parties with a much less enthusiastic approach to deficit reduction. This 24% of the electorate translated into 51% of the seats. They won. They have a mandate - but hardly an overwhelming or enthusiastic one. By contrast, the Conservatives hold 31% of the seats in the Lords - less than their popular vote but still greater than their proportion of the electorate, and much closer to their actual support in the country. Similarly, Labour have just 26% of the seats in the Lords, against 36% in the Commons, but again this is much closer to the election result. 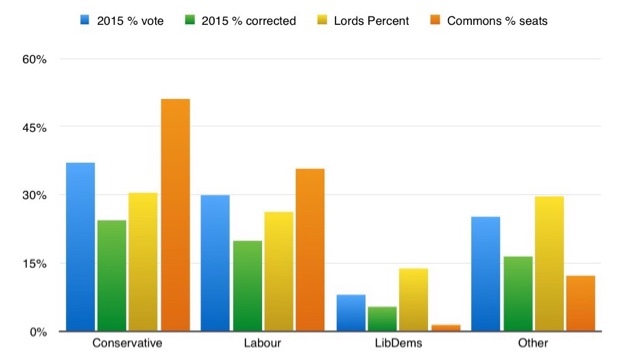 Even for the LibDems, the "huge" number in the Lords (14%) is closer to their actual percentage of the vote (8%) than their handful of MPs in the Commons (1%). Of course, for other parties there is less of a correlation, but if we just consider the issue of Tax Credits, the Lords looks more representative than the Commons. The numbers themselves, and a simple bar chart are below. Suffice to say that whatever the arguments may be over the rightness of this measure (that's the REAL point), and whatever parliamentary convention may properly dictate, and however the parties may decide to act on these principles, if the argument comes down to whether the Lords lacks the legitimacy to block the measure because it is unrepresentative, it should be very clear - the Lords has greater democratic legitimacy (on this matter at least) than this Tory Government. And that is why - irony of ironies - the Tories are talking of taking legislative steps to rein in the Lord's - steps threatened in the past only against Tory dominated Lords. Note: Voter turnout in the General Election was 66.1%. "2015 % corrected" indicates the proportions of the entire electorate, not only those who cast their votes.